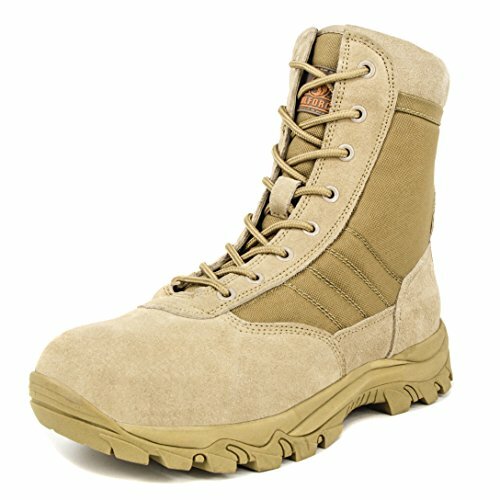 MILFORCE EQUIPMENT is a premium quality supplier of military boots with much OEM brand experience, serving customers worldwide, including Europe, North America and Russia etc. Established in 1984, has earned wide acclaim for its high quality products, advanced manufacturing processes and state-of-the-art innovations. Comfortable: Soft inner mesh lining + PU shoe pad + Thickening of collar with more sponge, help your feet get the maximum relaxation. If any questions, please feel free to contact MILFORCE team by email. Your satisfaction is our goal! Please pay attention: Milforce shoe size is a yard larger than a normal shoe, which means a size 9 Milforce is equivalent to standard USA size 10, and the rest can be measured in the same manner. If you are not sure about your size, measure your feet from heel to toe in inches. Please see the attached image and find the measurements for your reference. Choosing the right shoes will make your job and life easier. Water-resistant cow suede leather and nylon fabric upper with fore and back bumper in toe and heel, enhance the hardness and strength, for long lasting support and water resistant. Soft inner mesh lining with padded collar, makes the shoes breathable and moisture-absorbent, thus keep feet cool and dry. The removable PU shoe pad has of good permeability and shock absorption, and helps relieve feet stress efficiently, making long term wearing more comfortable. Compound of rubber and EVA outsole: EVA midsole with lightweight and energy absorbing ability; Rubble outsole has the characteristics of slip & oil resistance, perdurable worn, self-cleaning and shock-absorbing. Front laces and YKK heavy duty side zipper, for easy on and off. If you have any questions about this product by Milforce, contact us by completing and submitting the form below. If you are looking for a specif part number, please include it with your message.